You will asked to wear a gown during the exam. You should tell the technologist if you have medical or electronic devices in your body, because they may interfere with the exam or potentially pose a risk. You will lie face down on your stomach with your breasts hanging freely into cushioned openings, which are surrounded by a breast coil, which is a signal receiver that works with the MRI unit to create the images. 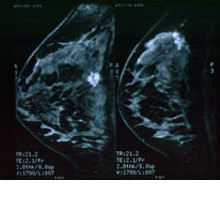 Except to diagnose implant rupture, all other breast MRI examinations require the administration of an MRI contrast agent. The contrast material used for an MRI exam, called gadolinium, does not contain iodine and is less likely to cause an allergic reaction. If contrast material will be used in the MRI exam, the technologist will insert an intravenous (IV) line into a vein in your hand or arm. A saline solution will drip through the IV to prevent blockage of the IV line until the contrast material is injected. You will be moved into the magnet of the MRI unit and the technologist will leave the room while the MRI examination is performed. Contrast will be injected into the intravenous line (IV) after an initial series of scans. Additional series of images will be taken following the injection. When the examination is completed, you may be asked to wait until the technologist checks the images in case anything else is needed. MRI exams include multiple runs (sequences), some of which may last several minutes. The imaging session lasts approximately 30-60 minutes. Peninsula Diagnostic Imaging’s Breast MRI service is accredited by the American College of Radiology (ACR).